An entry level course that weaves through a stand of pines and an open field on the east side of an historic estate house, just east of downtown. Dual tees (Red & White) and pin positions. Excellent signage. 3 par-4 holes for Ams (Pros may have a chance at eagle). A fun, “lunch-break” course that can be played fairly quickly from either tee. Funded by Suwannee County School Board and Suwannee County Parks and Rec. I-10; exit 283. South on Hwy 129 (Ohio Ave) 2.6 miles to a left (east) on U.S. 90 (E. Howard), 0.9 mile to a right on Lee Rd @ light. 400 yards to Helvenston Rd. Parking entrance is across Helvenston just right of Lee Rd. If I-75 NB: exit west on US 90 and go about 18 miles - through the light at Co Rd 49. 600 yds, veer left on Helvenston. West 0.75 mile to parking on left just past Lee Rd. 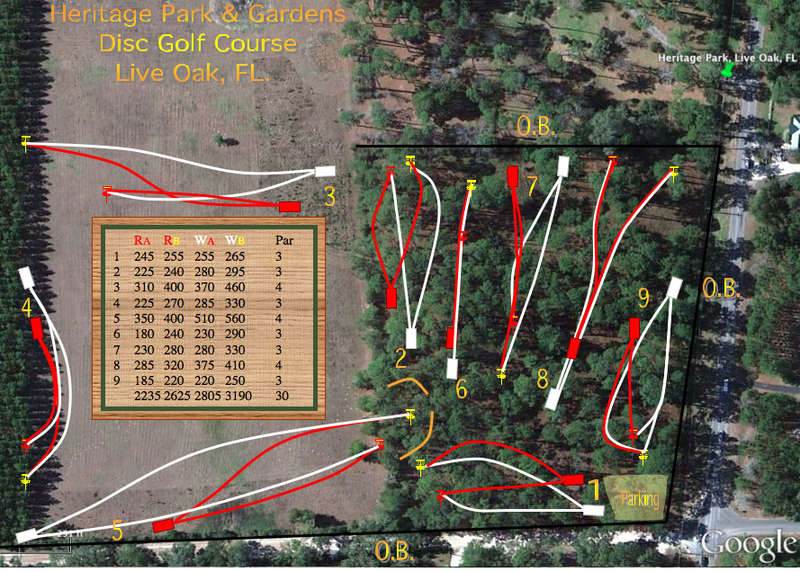 Have you played at Heritage Park and Gardens Disc Golf Course? Be the first person to review this course!